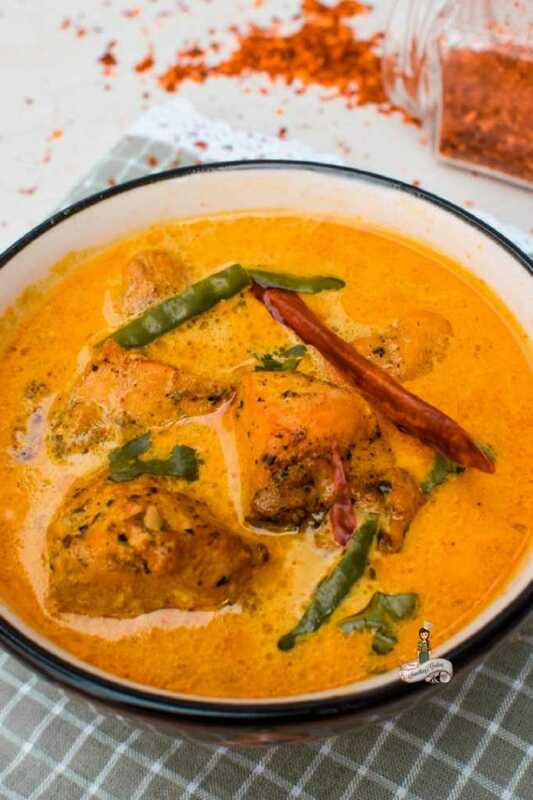 Loaded with juicy chicken chunks, spices and the warm malty flavor of tea, Chicken in Tea Infused Coconut Curry is made extra delicious with the addition of creamy coconut milk that will simply make your heart stop. So you’ve decided to travel to India. What would you do first? I would say, grab that hot, creamy, fragrant chai brewed with fresh cardamom, cinnamon, peppercorns, ginger, enough sugar and milk that will make you want to reach for one more. Head to any corner of India and you will be welcomed with this steaming cup of hot beverage. From streets to homes, it is one beverage that Indians cannot live without. Of course, there are exceptions but I also know of many who cannot start their day without it; my dad and husband included. For them, the day begins by sipping a hot cup of Chai and reading newspaper. 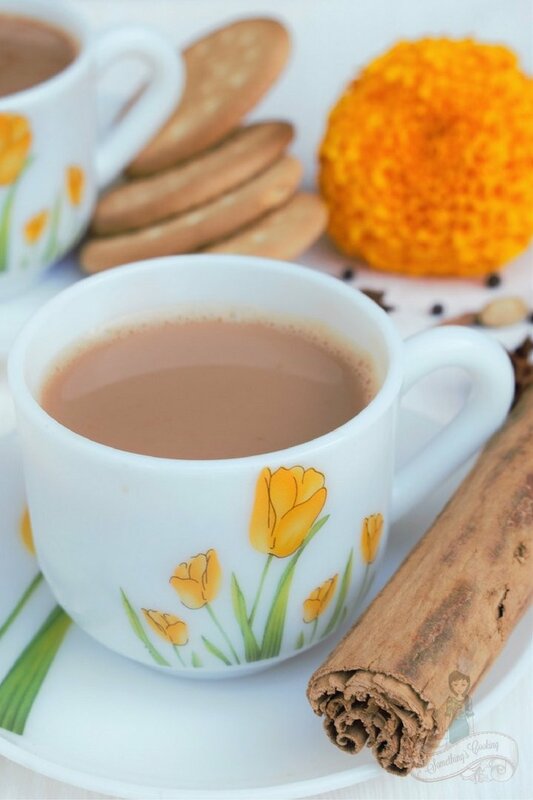 Chai is an integral part of our daily lives; be it get-togethers with friends and family, or that Chai Break during work, the never-ending discussions over Chai- Chai pe Charcha or to simply sit down with a book. The women in my husband’s household prepare liters of tea every day to be had and served throughout the day. While it may seem like an addiction, their idea is never to send a guest, a maid or a helper thirsty. 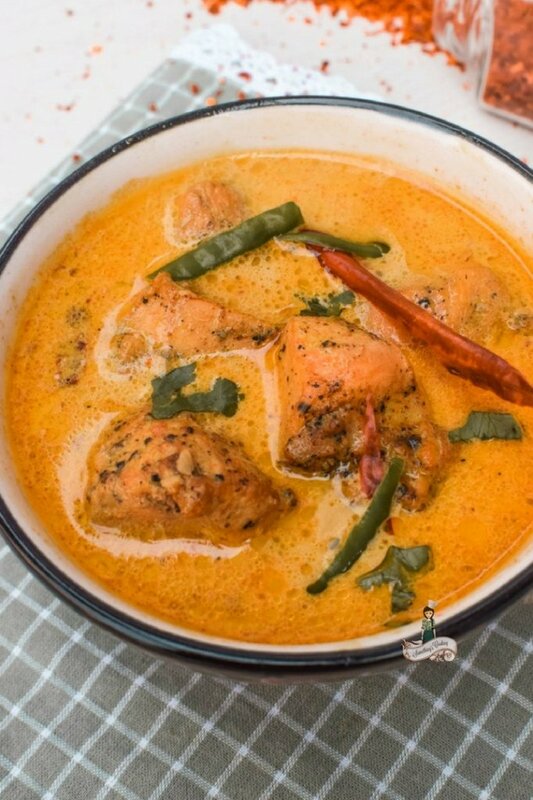 It is not only the flavor but it is also easy to prepare, satisfying and refreshing as well. My fond memories of Chai include savoring it by dipping Marie biscuits. I also loved Parle G and Tiger biscuits! Pakodas are yet another favorites to go with Chai. Drinking Chaya on the verandah and watching Kerala monsoon. Ha, Bliss! Why am I going on and on about Chai? 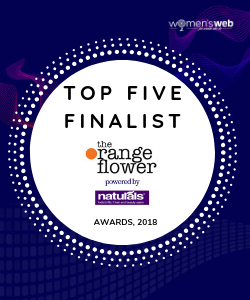 When I took a look at the Godrej Food Trends Report 2018, I found that Tea based cocktails and Tea as a cooking ingredient is one the most emerging trends of the year. That got me thinking and I decided to try my hand at it. I have only watched in TLC and LivingFoodz, how to prepare Tea-Smoked Salmon or Earl-Grey Tea Cake. But then, that’s the whole point of such reports, right? To comprehend and interpret. To conquer your fears, discover unique flavors and tastes and be spellbound! Godrej Food Trends Report 2018 is a compilation of latest food trends and is brought together by food experts and culinary gurus. 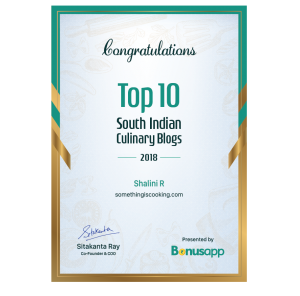 Along with various food rage including the use of tea, millets, mindful eating and regional cuisine, the report also focuses on rising trends in the restaurant industry, home kitchen, kitchen tools and gadgets, health and nutrition. Preparing the Tea sauce will take about a quarter to an hour and this deliciousness is definitely worth the wait. Great for special days and rainy evenings! What more could you want! 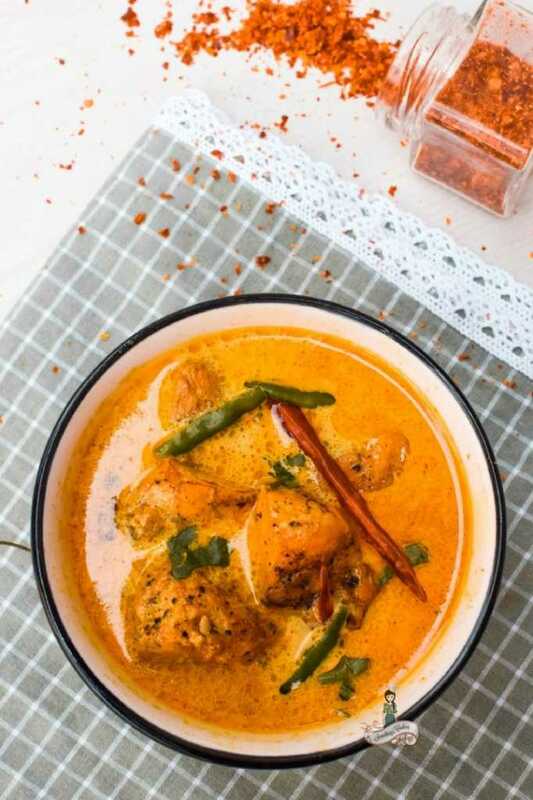 This recipe is adapted from one of my favorite chefs Vikas Khanna’s Prawns in Tea Infused Curry. I was a little disenchanted by the use of tea in a savory food. But I gathered my wits and gave into the indulgent senses. When the chicken chunks simmered in the tea sauce, I realized everything’s tasty in the universe. You just need to shake things up a little a bit and be ready to open your heart, mind, and soul. To start with brew tea leaves with coconut milk. Let it simmer for 30-45 mins. Strain and keep aside. Marinate the chicken pieces for about fifteen minutes with honey, turmeric powder, salt, and pepper. Toss up the chicken chunks in little oil and keep aside. Saute onion with chilies and garlic. Pour the tea sauce and add in the curry powder/paste. Add the pan-fried chicken and let it cook for 10-15 mins. Add a teaspoon of fresh cream and garnish with coriander leaves. Sounds really simple, don’t you think? You can add thinly sliced carrots or colored bell peppers as well. Feel free to swap chicken with any protein of your choice. Maybe turkey, lamb, eggs or tofu? Even go for corn kernels and peas, top it with lots of herbs – be it oregano, rosemary or fragrant basil. I went with the humble coriander as I didn’t want to overpower the dish and wanted to retain the mild tea flavor. Wash and clean chicken pieces. 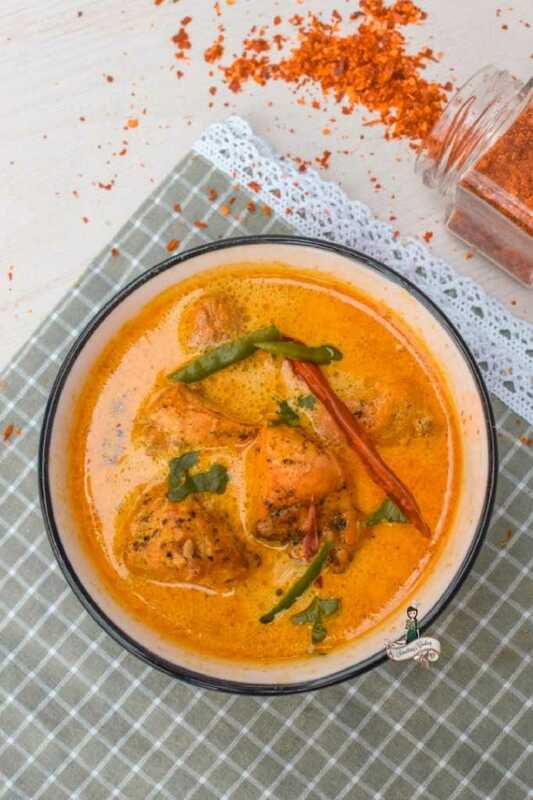 Marinate the chicken with honey, turmeric powder, oregano, pepper and salt. Keep aside for at least 15 minutes. Combine tea leaves with coconut milk. Brew and bring to a simmer over low-to-medium flame. Let it simmer for 30-45mins. Strain and keep aside. Let it cool down. Toss the marinated chicken pieces in little oil. Remove and keep aside. To the same pan, add onion, garlic, green chillies and veggies. Saute for a couple of minutes, until half-cooked. Stir in the tea sauce and pan-fried chicken. Add chicken stock and curry powder. Bring to a boil and simmer for about ten minutes. Remove from flame and add cream. Garnish with corinader leaves and serve hot. The sauce is a super-simple thing to make. It’s creamy, slightly sweet and spicy imbibed with a delicious tea flavor and aroma. It’s superbly well-balanced and I’d say treat yourself with this bowl of goodness this weekend. This sounds interesting. Never ever thought of including flavours of tea in chicken. Wil surely give it a try. Shalini first of all thanks a lot of bringing back the India memories. Actually, it made me nostalgic to some extent. I guess that the beauty of our Mother land. Whenever we read anything about India, it makes us emotional. 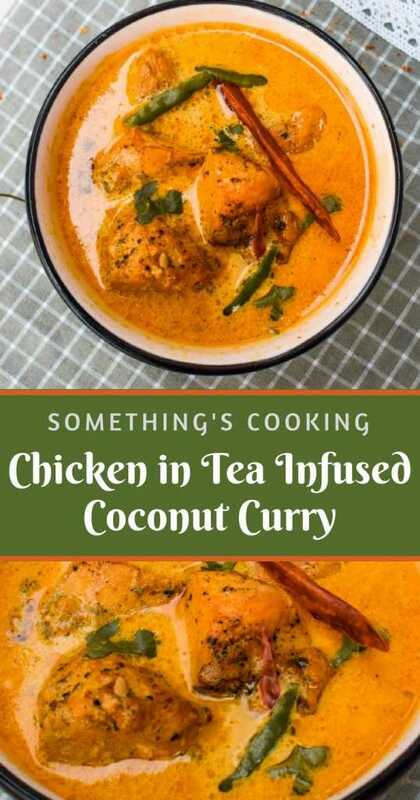 Coming to your recipe then I am not a vegetarian but I liked how you incorporated Indian flavor and a staple beverage into a main course dish. Wow! Your recipes are really cool. I have never had or heard any curry infused with tea! This must be an interesting combination. This recipe is a very nicely made with easy to follow steps. Earl-Grey Tea cake, wow that sounds delicious. I’m a Vegan so can’t try this recipe, but then we really need to get inspired from such reports and try out new flavours. I haven’t included tea in any of my dishes, but this one looks so mouthwatering! I need extra rice or a delicious naan bread for this one. 😀 Thanks for sharing!